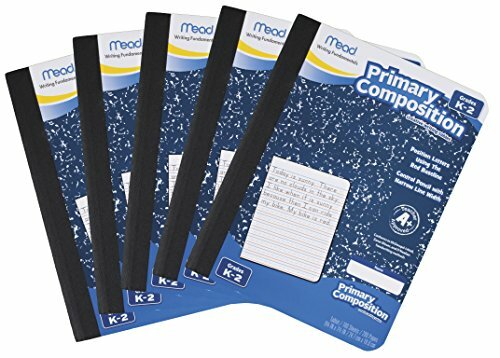 Primary Composition Book helps kids, grades K–2 develop creative writing skills. Kids position their letters using the redline cues, solid and dotted line primary ruling. A narrow line width helps them with pencil control. Inside front cover includes manuscript alphabet for reference. Conforms to the most popular writing methods. Durable cover with designated space for the student's name and secure sewn binding keeps pages intact. 9.75 inch x 7.5 inch page size. 9.75 x 7.5 x .44 inches overall. Pack of 5.